The John Cage Trust mourns the passing of dear Pia Gilbert (1921-2018), who died at home in her Upper West Side apartment in New York on Monday, May 14. Pia was a close friend to many, including John Cage and Merce Cunningham, and she was among my very first teachers during my graduate school years at U.C.L.A. Her life was rich and amazing -- you can access her Oral History conducted at U.C.L.A. in 1986-1987 here. You can also access a beautiful blog posted last year by the author Dawn Denham (formerly Haines) here, which centers around Pia's close friendship with the late American mezzo-soprano, Jan DeGaetani. While Pia is very much associated in my mind with Los Angeles (where she was close to the entire Schoenberg family), she retired from U.C.L.A. in 1985 and relocated to New York, where she took up a teaching position at the Juilliard School. She is survived by her daughter, Vivian, her brother, Hans and his wife, Barbara, and their three children, Rebecca, Jonathan, and Sarah. I am personally quite saddened by her death. And New York doesn't feel quite the same without her. The mycological world and beyond mourns the unexpected death on Friday, March 16, 2018, of one of its brightest lights, Gary Lincoff. Lincoff was well known in the field of mycology, the author of no less than seven mushroom identification guidebooks, including the essential Audubon Field Guide to Mushrooms (1981) and The Complete Mushroom Hunter (2015; rev. edition 2017). He was an early member of the New York Mycological Society, reconstituted (from two much earlier iterations) by John Cage, Guy G. Nearing, Lois Long, Esther Dam, and Ralph Ferrara in 1962. (Click here for a lengthy letter Cage wrote to disgruntled Society members two years into its new existence). Lincoff became one of Cage's long-time friends and valued colleagues. Lincoff later also became active with the Connecticut-Westchester Mycological Association (COMA) and the North American Mycological Association (NAMA), serving the latter as president from 1983 to 1988; he also taught classes on mushroom identification and related topics at the New York Botanical Gardens. Lincoff was expert and charming, with an infectious enthusiasm about all things fungi that charged many a budding amateur mycologist. You might recognize him from the 2008 Canadian feature film, Know Your Mushrooms, directed and produced by Ron Mann (Sphinx Productions), in which he and Montana's own mycologist-restauranteur Larry Evans were featured as "myco-visionaries." I never met Lincoff, without question my loss. But, I've known many people who were moved and inspired by him in addition to John Cage, including the author David Rose, whose work has been featured on "Kuhn's Blog" several times. I've heard David speak about Lincoff many times, and it's never been without reverence and an affectionate smile. Rose delivered a eulogy at Lincoff's funeral yesterday at the Plaza Jewish Community Chapel on Amsterdam Avenue in Manhattan. This eulogy appears below, with his kind permission. Lincoff is survived by his wife of many years, Irene Liberman, their son Noah Lincoff, and his brother, Bennett Lincoff. 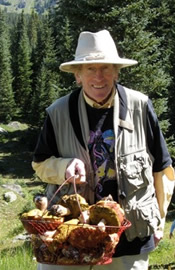 On behalf of the Connecticut-Westchester Mycological Association (COMA) I offer my sincere condolences to Irene and Noah, to Gary’s family, and to the countless friends of Gary Lincoff in the mycological community and beyond. Gary touched us all in a profound and indelible way. He taught us the science of fungi, and he helped us to know the beauty of the natural world in marvelous, intimate detail. The physicist Richard Feynman once recommended to his students, “Study hard what interests you the most in the most undisciplined, irreverent, and original manner possible.” I think we know that Gary Lincoff did just that. He forged his own path in mycology, botany, and nature study. In doing so he helped to create a living, lively community. Gary’s involvement with COMA began in 1975, the same year COMA was founded. He gave countless lectures; he came to every foray; and his last lecture was just last Saturday at COMA’s Mushroom University, which one might say was really “Gary Lincoff University” – a winter tutorial on mushroom genera and species that we’ve sponsored for several years. Gary gave an annual lecture for COMA every spring. I always enjoyed introducing him, for it gave us a chance to cut up and have fun right before his talk. I once introduced him by reciting the title of every talk he ever did for COMA. This exercise literally took well over five minutes – and he was slightly exasperated and amused by this, but I wanted everyone to know that here is a scholar whose dedication is absolutely unstoppable, going back almost half a century! And that was just for COMA! 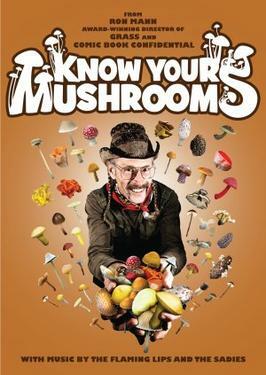 He did this for the New York Mycological Society, for the Telluride Mushroom Festival, and for how many others? never forget the special attention he gave to my daughters, teaching them how to identify Gomphus, and Leccinum, and other fascinating mushrooms. Gary Lincoff provided us with that one true vision. When so much of our world is garishly fraudulent, Gary Lincoff was authentic. His magnanimous friendship was authentic. He was loved by countless thousands of people, and he changed the world for us. We will miss him.